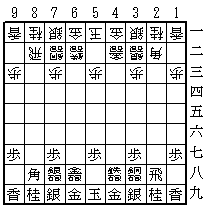 Cannon shogi (大砲将棋, taihō shōgi, cannon chess) is a modern variant of shogi (Japanese chess). It was invented by Peter Michaelsen in February 1998. Most of the English names correspond to rough equivalents in Western chess, rather than as translations of the Japanese names. Each piece has its name in the form of two kanji written on its face. On the reverse side of some pieces are two or three other characters, often in a different color (commonly red instead of black); this reverse side is turned up to indicate that the piece has been promoted during play. The pieces of the two sides do not differ in color, but instead each piece is shaped like a wedge, and faces forward, toward the opposing side. This shows who controls the piece during play. The game is often played with "Westernized" (or "international") pieces, which replace the kanji with more intuitive symbols, such as pictorial icons. Listed here are the pieces of the game and, if they promote, which pieces they promote to. English speakers sometimes refer to promoted bishops in shogi and its variants as horses and promoted rooks as dragons, after their Japanese names, and generally use the Japanese name tokin for promoted pawns. Silver generals and gold generals are commonly referred to simply as silvers and golds. The characters on the backs of the pieces that promote to gold generals are cursive versions of 金 'gold', becoming more cursive (more abbreviated) as the value of the original piece decreases. These abbreviated characters have these equivalents in print: 全 for promoted silver, 今 for promoted knight, 仝 for promoted lance, and 个 for promoted pawn (tokin). Another convention has abbreviated versions of the original characters, with a reduced number of strokes: 圭 for promoted knight, 杏 for promoted lance, with promoted silver the same 全 as above, and と for tokin. Each side places his pieces in the positions shown below, pointing towards the opponent. The gold cannon in the same file as the gold general on the player’s left. The silver cannon in the same file as the silver general on the player’s left. The iron cannon in the same file as the gold general on the player’s right. The copper cannon in the same file as the silver general on the player’s right. In the third rank, the five pawns are placed in the same files as the lances, silver generals and king. Each piece in the game moves in a characteristic pattern. Pieces move either orthogonally (that is, forward, backward, left, or right, in the direction of one of the arms of a plus sign, +), or diagonally (in the direction of one of the arms of a multiplication sign, x). The knight is an exception in that it does not move in a straight line. The pawn moves and captures a single square forwards or sideways, like the soldier of Korean chess (janggi). It promotes (optionally) to a tokin (gold general) when making a move that begins or ends in the last 3 ranks of the board. The lance has the same move as in shogi. It may move any number of empty squares forwards (i.e. : in the same file), capturing the first opposing piece it encounters. The lance promotes (optionally) to a gold general when ending a move in the second or third last ranks of the board. If ending its move in the final rank it must promote. The knight has the same move as its equivalent in shogi. It may move one square forward followed by one square diagonally forward to a square that is either empty or occupied by an opposing piece, jumping over any intervening piece of either side in the first square. If landing on a square occupied by an opposing piece that piece is captured. The knight promotes (optionally) to a gold general when ending a move in the third last rank of the board. If ending its move on either of the final two ranks it must promote. The silver general is the same as in shogi. It moves and captures a single square forwards or diagonally in any direction. It promotes (optionally) to a gold general when making a move that begins or ends in the last 3 ranks of the board. The gold general is the same as in shogi. It moves and captures a single square diagonally forwards or orthogonally in any direction. It does not promote. The bishop is identical to that in shogi. It may move any number of empty squares in any diagonal direction, capturing the first opposing piece it encounters. The bishop may optionally promote to a dragon horse when beginning or ending a move in one of the final 3 ranks on the board. As a dragon horse it may either move as a bishop or move one square orthogonally. The rook is the same as in shogi. It may move any number of empty squares in any orthogonal direction, capturing the first opposing piece it encounters. The rook may optionally promote to a dragon king when beginning or ending a move in one of the final 3 ranks on the board. As a dragon king it may move either as a rook or one square diagonally. The gold cannon moves as a rook, by sliding any number of empty squares along a row or column, but can capture an enemy only if there is another piece (of either side) in between. Thus to capture the gold cannon leaps over the intervening piece and lands on the enemy piece, like a cannonball. This is the same move and capture as the cannon (Pao) of Chinese chess (xiangqi). The gold cannon may promote (optionally) if it begins or ends its move in one of the last 3 ranks of the board. On promotion it becomes a flying gold cannon. As a flying gold cannon it may move orthogonally over whole rows and is able to leap one piece while moving. Additionally, it can move one square diagonally, or move or capture two squares diagonally, by leaping an adjacent piece. The silver cannon captures in the same way as the gold cannon, but can only move by leaping over an intervening piece, called a screen. This is the move and capture of the cannon of Korean chess (janggi). The silver cannon may promote (optionally) if it begins or ends its move in one of the last 3 ranks of the board. On promotion it becomes a flying silver cannon. As a flying silver cannon it has the same powers as the flying gold cannon. It may therefore move orthogonally over whole rows and is able to leap one piece while moving. It can also move one square diagonally, or move or capture two squares diagonally, by leaping an adjacent piece. The copper cannon moves as a bishop, by sliding any number of empty squares in a diagonal direction, but can capture an enemy only if there is another piece (of either side) in between. Thus to capture the copper cannon leaps over the intervening piece and lands on the enemy piece, like a cannonball. This is the same move and capture as the gold cannon, but in a diagonal rather than orthogonal direction. The copper cannon may promote (optionally) to a flying copper cannon if it begins or ends its move in one of the last 3 ranks of the board. As a flying copper cannon it gains the power to move diagonally over whole rows to leap one piece while moving. Additionally, it can move one square orthogonally, or move or capture two squares orthogonally, by leaping an adjacent piece. The iron cannon captures in the same way as the copper cannon, but can only move by leaping over an intervening piece, called a screen. The iron cannon may promote (optionally) to a flying iron cannon if it begins or ends its move in one of the last 3 ranks of the board. As a flying iron cannon it has the same powers as the flying copper cannon. It may therefore move diagonally over whole rows and is able to leap one piece while moving. It can also move one square orthogonally, or move or capture two squares orthogonally, by leaping an adjacent piece. The king has the same move as in shogi. It may move one square in any direction. A player's promotion zone consists of the three farthest ranks, at the original line of the opponent's pawns and beyond (that is, the opponent's territory at setup). If a piece crosses the board within the promotion zone, including moving into, out of, or wholly within the zone, but not including drops (see below), then that player may choose to promote the piece at the end of the turn. Promotion is effected by turning the piece over after it moves, revealing the name of its promoted rank. Promoting a piece has the effect of changing how that piece moves until it is captured and removed from the board. If a piece that cannot retreat or move aside advances across the board until it can no longer move, it must be promoted. This applies to the lance, upon reaching the farthest rank, and to the knight upon reaching either of the two farthest ranks. Below are diagrams indicating each piece's movement. Pieces are paired with their promotion. Pieces with a gray heading start out in the game; those with a blue heading only appear on the board after promotion. Betza's funny notation has been included in brackets for easier reference. The king general goes to the superior player. The dragon can move any number of free squares along any of the four orthogonal directions. The horse can move any number of free squares along any of the four diagonal directions. The flying gold cannon can move any number of squares along any of the four orthogonal directions but must jump at least one piece to capture. The flying copper cannon can move any number of squares along the four diagonal directions but must jump at least one piece to capture. A knight that reaches one of the two farthest ranks must promote. Captured pieces are truly captured in cannon shogi. They are retained "in hand", and can be brought back into play under the capturing player's control. On any turn, instead of moving a piece on the board, a player can take a piece he has previously captured and place it on any empty square, facing the opponent. The piece is now part of the forces controlled by that player. This is termed dropping the piece, or just a drop. Pieces that are dropped in the promotion zone do not promote as a result: Promotion requires that piece make a normal movement on a subsequent turn, as detailed under "Promotion", above. No knight or lance may be dropped on the farthest rank, since it would have no legal move on subsequent turns. Similarly, a knight may not be dropped on the penultimate rank. Unlike in shogi, there are no additional restrictions when dropping pawns: a pawn can be dropped into the same file (vertical column) as another unpromoted pawn controlled by the same player. Also a pawn can be dropped to check the opponent's king, if the opponent would have no way to prevent his king being captured on the next move. In other words, a pawn can be dropped to give immediate mate. When a player makes a move such that the opponent's king could be captured on the following move, the move is said to give check to the king; the king is said to be in check. If a player's king is in check and no legal move by that player will get the king out of check, the checking move is also mate, and effectively wins the game. A player who captures the opponent's king wins the game. In practice this rarely happens, as a player will resign when checkmated, as otherwise when loss is inevitable. The game reaches an impasse if both kings have advanced into their respective promotion zones and neither player can hope to mate the other or to gain any further material. If this happens then the winner is decided as follows: each rook, bishop and cannon scores 5 points for the owning player, and all other pieces (except kings) score 1 point each. Promotions are ignored for the purposes of scoring. A player scoring less than 38 points loses. If both players have at least 38 points, then the game is no contest. Games which are no contest are usually counted as draws in amateur tournaments, but in professional style tournaments the rules typically require the game to be replayed with colors reversed (possibly with reduced time limits). Games between players of disparate strength are often played with handicaps. In a handicap game, one or more of White's pieces is removed before the start of play, and White plays the first move of the game. Note that the pieces removed at the beginning play no further part in the game - they are not available for drops. The imbalance created by this method of handicapping is not as strong as it is in chess, because material advantage is not as powerful in shogi as in chess. With the introduction of the cannons of Chinese and Korean chess, as well as their diagonal counterparts, the inventor wanted to add a new dimension to the classical game of shogi. With a pawn array similar to the one used in Chinese and Korean chess, the opening game tends to be much more tactical and explosive than in ordinary shogi. Not only because of their high number, the cannons dominate play more than in xiangqi and janggi. Because of the drops, they are more mobile and dangerous in all phases of the game. They may be weakened a little on board, as more and more pieces are captured and kept in hand, but may still be very useful when dropped on the board again, or when other pieces are dropped in front of them. The Pawns move and capture sideways as well as forwards, because the inventor thought that they needed some compensation, being only 2x5 against 2x15 officers.